One of the design requirements of the new wireless generation 5G infrastructure is guaranteeing nearly 100 percent uptime and ultra-consistent network services. Many of the services that rely on 5G include self-driving vehicles, health services, traffic orchestration, energy power-grid management and other services directly responsible for public safety. 5G key performance indicators (KPI) specified Ultra Reliable Low Latency Communication (URLLC) service requirements of no more than 10^-5 (0.001%) of 20 byte packets can fail to be delivered by 1ms. This is a packet and latency service level commonly provided by network service providers. This is about 99.999 percent reliability and 99.999 percent availability. This low-packet error rate is helpful, but networks must be available 24 by 7, every day without fail. Customers require “guaranteed service” not only for latency and reliability, but also connectivity. The most vulnerable segment between client devices or the network edge and the carrier network is the last few hundred feet of communications running over wireless technologies. Everyone has experienced dropped calls. The 4G specification was designed for smartphones and not for critical network services. Wireless links notoriously ﬂuctuate in quality, leading to variable packet error rates, which are orders of magnitude higher than wired. 5G has increased the vulnerability of the wireless technologies with the inclusion of high frequencies from the mmWave spectrum. mmWaves are line-of-sight directional and easily blocked. Rain and other obstructions routinely cause network packet errors, often resulting dropped links and outages. These network challenges can be managed with new 5G technologies like beamforming, network fast-failover, SDN technologies and wireless packet retransmission protocol features. These methods will be covered later in this article. Service confidence levels can be achieved with a well-planned network architecture. These include radio access technology (RAT), measuring the spatial availability of a wireless link for a service-relevant conﬁdence level, temporal availability and falling back to other RATs (e.g., LTE). 5G wireless networks are implemented using a combination of diversity coding and network coding schemes. These represent a forwarding architecture for wireless mesh networks, which improves throughput and consistent network performance. A coding layer is inserted between the IP and MAC layers. This provides robust link-failure recovery and near-instantaneous packet recovery. Traffic can be routed across diverse paths for greater network throughput and reduced retransmissions using error-control techniques. 3GPP Release 15 includes a few reliability improvements over 4G LTE. The flexible frame structure with various options for sub-carrier spacing, modulation and coding provide a solid foundation at the physical layer. 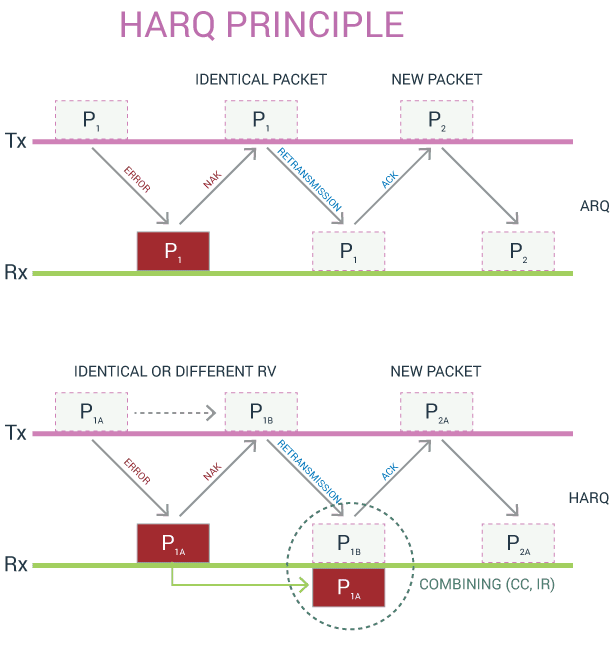 Hybrid automatic repeat request (HARQ) and ARQ are included and will initiate "retries" on corrupted data. In addition, the 3GPP specification includes reference signals to improve synchronization, enhancing demodulation efficiency and significantly reducing packet data corruption and errors. Network slicing allows network traffic to be identified by various characteristics and isolated to different logical subnets. Critical traffic can be identified and provided a guaranteed performance characteristic like bandwidth, latency and reliability. Lower priority traffic can be further isolated to other slices. This provides a mechanism to guarantee critical network traffic is unencumbered by other traffic loads. Network slicing technology is provided by Software-Defined Networking (SDN) and Virtual Network Functions (VNF). SDN technologies provide isolated logical networks and intelligently steer traffic through the carrier infrastructure. Network Function Virtualization (NFV) orchestrates network packet processing in virtual server environments. Each network slice has an isolated set of packet-processing virtual machines. Network slicing provides reliability and availability by slicing off a portion of the 5G network end-to-end. This network slice is isolated from other traffic and has a defined and guaranteed level of service. 5G network architectures have redundant hardware, software and network links with automated failover technologies. This guarantees that no system or network outage will interrupt network services. 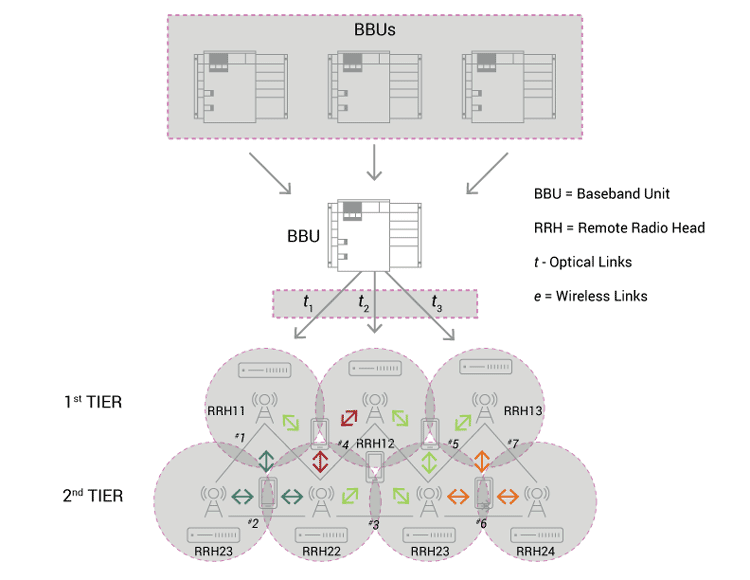 In the figure above, multiple baseband unit (BBU) systems have multiple redundant network connections. Each BBU can take over the functions of a failed BBU. The remote radio heads (RRH) wireless towers are fronthaul-connected to multiple BBU stations with dark fiber networks, and each RRH tower has wireless network connections to other RRH towers. Each RRH tower covers an area that overlaps with other towers. A loss of one tower will not leave a gap in service coverage. Reliability to business or organizational facilities can be provided by redundant and diverse connections to the 5G carrier networks. Wireless connections should be made to two or more 5G base stations. Failed network links or components can be rerouted to back-up or redundant network links. High reliability is one of the key design specifications for 5G. Mission-critical services such as connected robotic factories, remote surgery, patient care and driverless cars are required to be constantly connected to the network. As such, 5G network outages could be life threatening. The 5G architecture has been designed to be highly available with redundancy integrated into every component. Network architects can extend this level of reliability and availability with a well-planned architecture that includes redundant 5G network access paths and hardware. A10 Networks provides products for high-performing network and security systems that process millions of concurrent sessions in real time. A10 Networks’ customers include the largest network carriers and cloud service providers in the world. The company’s portfolio of products is broad and covers end-to-end network service provider infrastructures from network-edge computing, distributed packet-core processing and central-office infrastructures to public clouds. This broad set of products from a single vendor reduces deployment, operations and management costs, therefore reducing TCO.